... a boxed copy of Nintendo's Clu Clu Land. 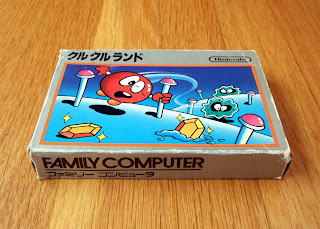 Note that I didn't describe this as a "complete in box" copy of this Famicom/NES classic. That's because the plastic tray that's supposed to cradle the cartridge (and protect the box) wasn't included. Oh, well. Regardless, I quite like Clu Clu Land's box art. To tell you the truth, that's the main reason I picked up the copy seen in the photos above and below, as I'm not much of a fan of the game at this point. 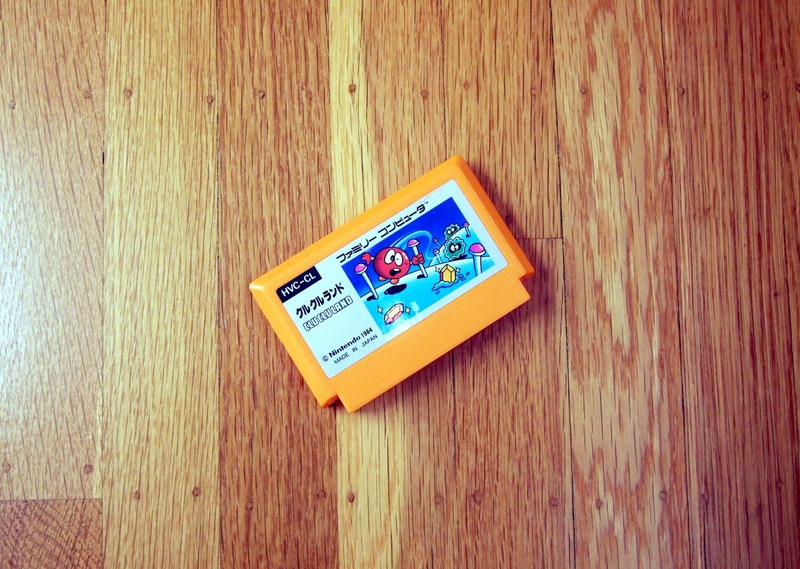 I'm also a bit of a sucker for banana-yellow Famicom carts, it seems, as not only do I salivate over the one that contains Clu Clu Land's code, but I also salivate over the ones produced for the Famicom version of Super Mario Bros. and the GameBoy Advance version of Kid Icarus. 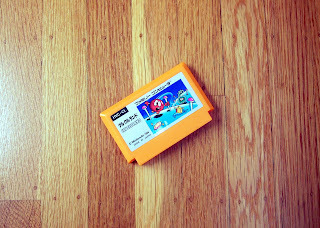 Fore more photos of yellow (as well as red, orange, blue and white) Famicom carts, check out this Flickr set. BTW, I love your story about the Zelda action figures. I don't remember those! Which characters are represented? Also, why have you left them in their bags? Hoping to unload them on eBay some day? I love Clu Clu Land. I think it is one of the best looking Famicom carts out there - the balance between the blue in the art and the orange plastic is great. I actually like the game myself. Maybe it is like Ice Climber, it will take a while to grow on you! I agree, Sean -- Clu Clu Land's box art is great! I especially love the little blobs that are chasing, er, Clu Clu (is that the main character's name?). I've got Link, Zelda, and Ganondorf from Ocarina of Time. And...I don't know why they're still in their respective bags. I was in a collecting phase. They're stored away somewhere...but I would have to search my mom's house since they've been boxed up and moved without my help at least once. I'd love to get them out and play with them. I have no intention of ever getting rid of them. Ah, that's an interesting story, Justin. I hope you find them at some point -- and then take photos of them (even wrapped up), as I'd love to see what they look like.